WinTricks is one of the largest and most up-to-date programs for Windows tips,tricks, and secrets available today! WinTricks includes tips/tricks for all versions of Windows, plus the Registry, Desktop, Laptop, Internet, and more. You will find that this program is easy to navigate and has complete instructions on all of our Tips, Tricks, and Secrets. Performing basic tasks in Windows poses no problems for the majority of users who touched a mouse and a keyboard at least one time. However, more advanced operations might require the user to go to the Windows help files or look for a solution online. WinTricks is an alternative to both, providing a rich collection of tips and tricks that includes how-to instructions for solving various issues. The goal of WinTricks is to offer a helpful guide to solving different problems in Windows and carrying out various tasks. Aiming to meet the requirements of all users, WinTricks comprises tips for all iterations of Windows, from Windows 10 all the way back to Windows 95. Available as a help (CHM) file itself, WinTricks displays all the information in tree view, making it easy for anyone to browse the manual and find what they are looking for. Furthermore, the built-in search form can look for keywords, showing the results in no time. To exemplify the instructions in the manual specifically, let’s take, for instance, Windows 10. Users can get helpful tips on how to access and customize the Start Menu, manage ownerships, disable the automatic updates, find the original Control Panel, configure Cortana, share a printer, and much more. Additionally, they can browse a complete list of keyboard shortcuts that can make their experience more pleasant. WinTricks also bundles a few tips for Windows Server editions, including 2003, 2008 and 2012. Users can learn how to join a domain, configure the Local Server Manager, shutdown and restart the server, and more. WinTricks might not have a solution to each and every problem one faces when using Windows, but it does reveal a few secrets that are useful to anyone. And while the answers to some questions can be easily found online, it is definitely more comfortable to have it all in a single place. 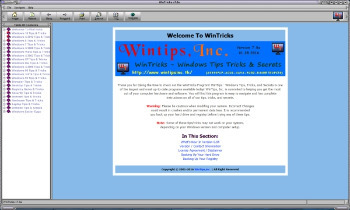 Additionally, WinTricks comes with a few tips for using browsers and navigating on the Internet, managing hardware, keeping the computer and the stored data secure, and using a laptop.